No Returns..All Purchases Are Final.. because I Really really need the room..not buyers remorse:)..I’m Already going through that! :) That’s one of the reasons I’m here:) haha! ..It Doesn’t mean I don’t take care of my customers..Just the opposite! I Totally Appreciate my customers!.. and I want you to be Completely Happy and Satisfied with your purchase from your first interest to your delivery and beyond! So Please buy w/confidence..All my listings Are Guaranteed to be as described seeing as I know where they came from:) and I do research most everything anyway..or at least try. My listings are honestly detailed as you can see..but should you have Any other Questions..Requests..or just a comment..or maybe I missed the one thing you’re wondering about?..please..Don’t hesitate.. send me a note..All are Welcomed and replied to Promptly. If you have Any issue or concern before..during or upon delivery of your item-s..Please again..Don’t hesitate to contact me ASAP. There is No issue or concern that can’t be happily resolved for both parties:) Thanks Very Much:) I Do Appreciate your time! For your consideration..in Excellent Condition! Beautiful! 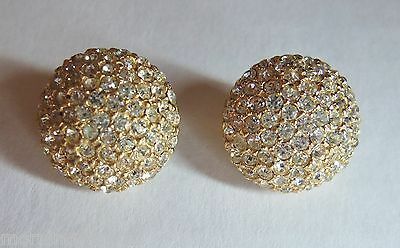 Vintage "Signed Les Bernard..Patent #156452" Pave Clear Glass/Crystal Rhinestones Domed Huggie Button Clip Earrings in a Gold Tone Setting. Petite with Pizazz! Measures..5/8" diameter..a tad smaller than a US dime:) Full cut Stones are Chip Free..Clean, Clear Sparkly! All accounted for! Clips work nicely as should:) Name on outside of clip patent # on inside of clip. Upon researching..I believe the Pat.# is for the mechanics style of the clip portion of the earrings. These cuties Truly don't seem to have been worn much at all! No wear:) Very Well Cared for in Super Condition! Great addition to your jewelry wardrobe! or.. Not just these, but All types of earrings..maybe you just have "one" you can't part with..Never just for your ears:)..Perfect to decorate with too! Great to pinch those pretty sheer lace curtains with:) or that beautiful lightweight scarf..nice as collar tabs..clip one at the bottom of your pretty window shade..baskets..visors in your car..on your hat:).. Endless possibilities! Enjoy! Please consider..pictures in No Way reflect the True Beauty of these! Pics. just don't show the Shine of the gold Sparkle of the stones that they Do have in hand:) Please look Closely at my pictures for items detail condition..they Are part of my description. If you have Any questions or requests on this item..Please email me B4 you purchase..All welcomed and replied to promptly:) All my items are family owned..unless otherwise (rarely:) stated. Some 3 generations! Like my Antiques and Glass such! Check out my other items! I will Happily combine purchases when safely possible..please send a note of interest B/4 making Any purchase..I can send you an invoice w/a purchase total..otherwise..Immediate payment is required..Thank you:) PayPal Only. Your Item-s will Always be Nicely Packed Shipped w/in One Business day of Cleared Payment. Happily insured upon request..Please do so B/4 you purchase..I will send you a revised invoice:) Thanks Very Much for a bit of your time! Enjoy the rest of your day!